With the passage of the Tax Cuts and Jobs Act, nearly everyone will see a tax cut starting in 2018. Marginal tax brackets for individuals will be reduced and the standard deduction will double. Corporate tax rates will drop to 21%. 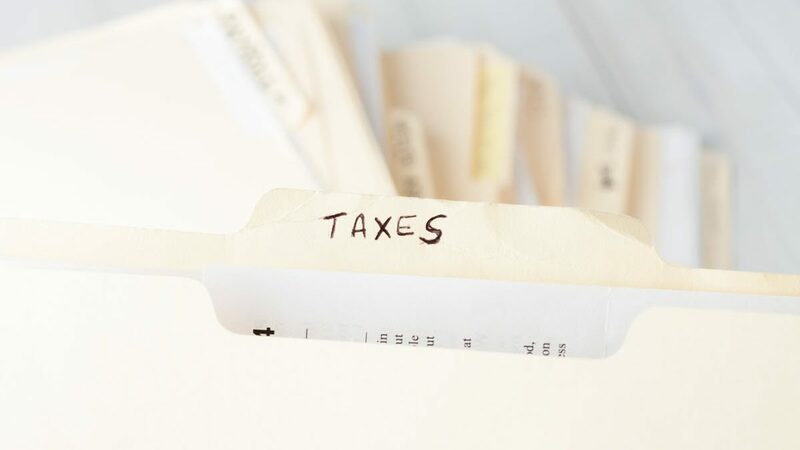 Owners of many pass-through businesses including partnerships, S corporations and sole proprietorships will be able to deduct 20% of their share of business income subject to certain limitations. But for lawyers and other professional services firms, it’s a mixed bag. Let’s start with the good news. 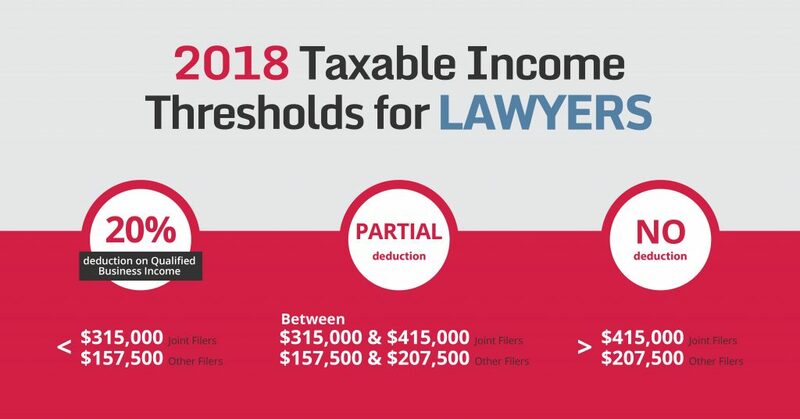 Many lawyers will benefit from the lowering of the top individual tax rate from 39.6% to 37%. Also, the tax bill increases income thresholds for the higher tax brackets. For example, a joint filer with taxable income of $300,000 would be in the 33% marginal tax bracket using the pre-tax reform rates. With the new tax bill, a joint filer with $300,000 taxable income will be in the 24% tax bracket. Depending on filing status and income level, many individuals will see a 10%-15% reduction in tax liability because more income will be taxed at lower tax brackets. One of the big changes relates to “qualified businesses” that operate as pass-through entities (PTEs) such as partnerships, S corporations and sole proprietorships. 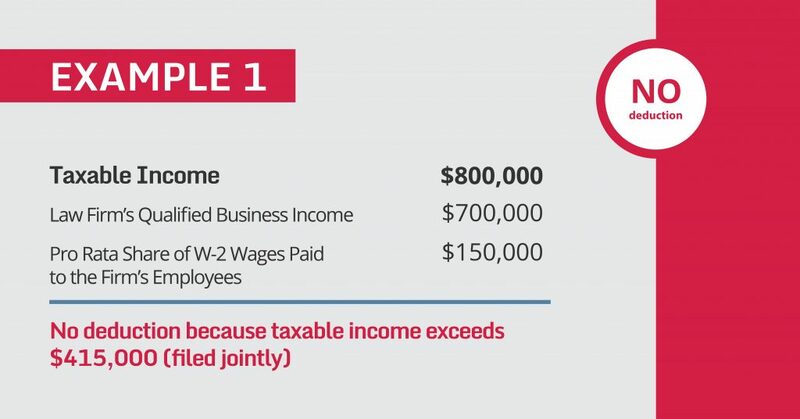 As a general rule, qualified business owners of PTEs will be able to deduct 20% of their share of “qualified business income” subject to a W-2 wage limitation. Qualified business income (QBI) is defined as the owner’s share of pass-through entity net income usually reported on the owner’s Schedule K-1. It does not include W-2 compensation or guaranteed payments made to the owner. The presumption is that the deduction will be reported after adjusted gross income and before taxable income on the individual tax return. So tax attorneys and CPAs have job security, the 20% deduction is subject to threshold and phase-in limits and special definitions. Law firms fall into the category of “specified service businesses” which includes professional trades or businesses involved in the performance of services in the fields of health, law, accounting, actuarial science, performing arts, consulting, athletics, financial services and brokerage services. Therefore, law firms are not included in the definition of a “qualified business” and generally do not qualify for the special 20% deduction. However, if the law partner’s taxable income reported on Form 1040 does not exceed a special threshold amount ($315,000 – joint filer, $157,500 – other filers), the 20% deduction is generally available without limitations. If the partner’s taxable income exceeds $415,000 (joint filers) or $207,500 (other filers), the 20% deduction is not available. Ricky and Lucy file a joint return on which they report taxable income of $800,000. Ricky is a partner in the law firm of Ricardo & Mertz, LLP. Ricky’s share of the law firm income (qualified business income) is $700,000, his pro rata share of W-2 wages paid to the employees of the law firm is $150,000. Ricky is entitled to no deduction because a law firm is a specified service business and his taxable income exceeds $415,000. Therefore, he is completely phased –out of any deduction. Same as Example 1, except Ricky’s taxable income is $300,000, his share of law firm income is $200,000, and his share of wages is $60,000. Even though Ricky practices law, he may take the deduction because his joint taxable income is below $315,000. As a result, he can take a deduction of 20% of $200,000, or $40,000, without being subject to any limitations. A “W-2 limitation” based on wages or wages plus a capital element. 25% of wages paid by the PTE plus 2.5% of the unadjusted basis of “qualified property”. Qualified property is tangible property subject to depreciation used in the business. W-2 wages are the total wages paid by the PTE with respect to employment of its employees during the calendar year. An “applicable percentage” is factored in to reduce the deduction as taxable income increases in the phase-in range. 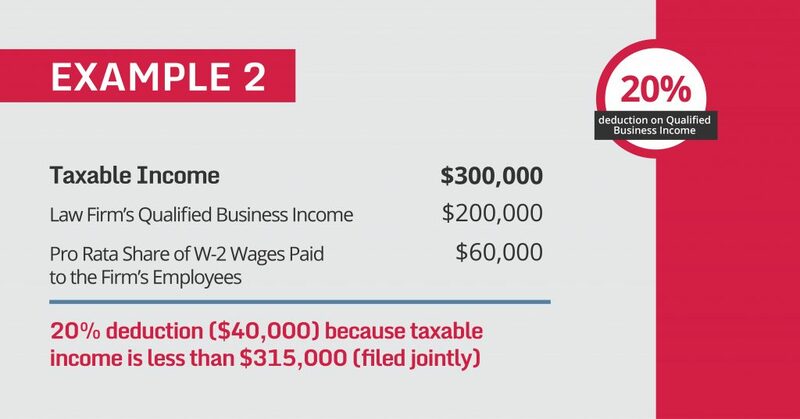 Bottom line: If you have pass-through income from you law firm and your Form 1040 taxable income is below the thresholds ($315,000 for joint filers and $157,500 for other filers), you can take the full 20% deduction on your personal Form 1040. If your taxable income is over $415,000/$207,500, you get no deduction. If taxable income is between $315,000/$157,500 and $415,000/$207,500, you may get a partial deduction. Another benefit applies to firms that operate as personal service corporations (PSCs). 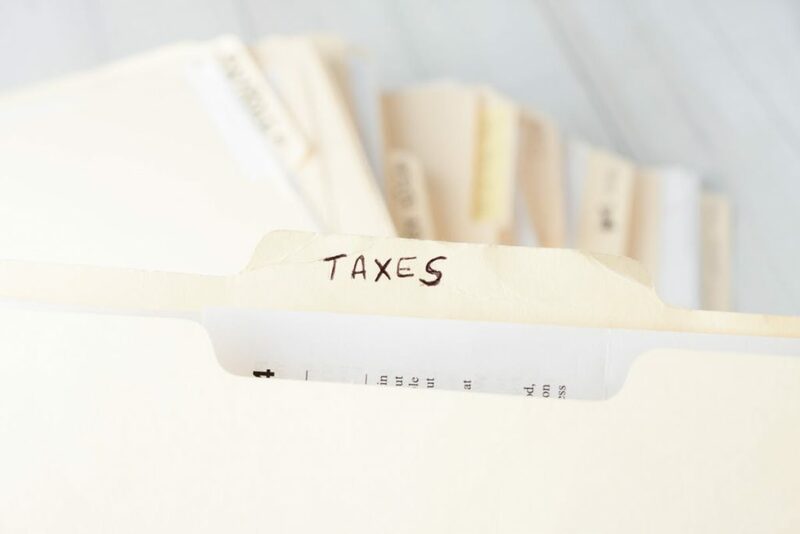 Currently taxable income of a PSC is taxed at a flat tax rate of 35%. The House bill proposed a flat rate of 25%. Under the final bill, PSCs will be taxed like regular C corporations at a flat rate of 21%. So if a law firm operates as a PSC and retains profit in the corporation, the profit will be taxed at 21%. Most firms operate as pass-through entities rather than PSCs because they prefer to distribute partner profits by yearend. 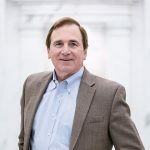 One proposed change that didn’t make it in the final bill was the requirement that high-income law firms and other professional firms use the accrual method. This would have forced many firms to pay taxes on uncollected fee income such as accounts receivable. The massive new tax bill will impact about every business and individual taxpayer including law firms and lawyers. Right now there are more questions than answers. Should I change to a C corporation? Do I need to reconsider how I get paid? Because qualified business income does not include W-2 and guaranteed payments, do I need to change our firm compensation structure? Should income partners be reclassified as a separate class of equity partner? Because no two firms are the same, each firm will need to look at its own situation and plan accordingly. If you have questions about your firm’s specific structure and tax implications, please contact David Epperson. Contact David Epperson to learn more.